.Split and scrape vanilla bean, adding shell and pods to saucepan. Add cream, and heat on Low until scalded. Remove from heat. In a medium bowl, mix sugar and salt. Separate the yolks from the egg whites, gently whisk yolks into sugar mixture until just combined (save whites for use in something else). Temper hot cream into the egg mixture; adding one third at a time, stirring it in. Pour liquid through a strainer, into a glass measuring cup. Use spoon to scrape the bottom of your glass measuring cup, where all the vanilla bean has sunk, make sure each ramequin has a fair amount of the bean; then pour the strained liquid into the ramequins. Place ramequins into bain marie, set in oven. Bake 35-40 minutes until the edges of the custard are set. Test for doneness by shaking, the centre should wobble like Jell-o. If the whole surface shakes give it 3-5 more minutes. If nothing shakes it’s overdone. Remove pan from oven, carefully remove ramequins from pan. Cool on wire rack 1 hr. Cover each ramequin with plastic wrap, chill overnight. Remove from fridge 30 minutes before consuming. Let sit 20 min, then remove the plastic wrap, and use a folded piece of paper towel to gently blot the surface to remove any condensation. Sprinkle the demerara sugar on top, tilting and tapping each ramequin to cover the entire surface. Place ramequin on a fireproof surface like a marble slab, and use torch to carmelize the sugar. Return to fridge for 10-30 minutes, then eat. NOTE: Dry sugar is much easier to caramelize. Regardless of what type of sugar you use for the topping, you’ll get better results if you let it sit out overnight, uncovered, so it can dry out. The next day when you are ready to eat it, put the sugar in a plastic bag and crush with a rolling pin, before sprinkling onto custard. 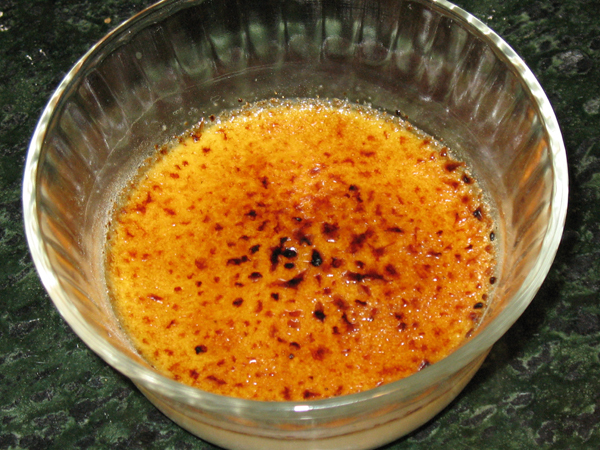 Creme Brulee – a fav of mine! Looks great.